Click image to view in full size. With thousands of members all over the world, Straight Key Century Club (SKCC) has become a real presence on the HF bands. Dedicated to preserving the art of manual telegraphy, SKCC sponsors events, awards, and now an exclusive telegraph key engraved with the club's logo. SKCC operates a newsgroup and forum, and has an extensive web site at www.SKCCGROUP.com. The SKCC Key is craftsman-made by LTA in Spain. 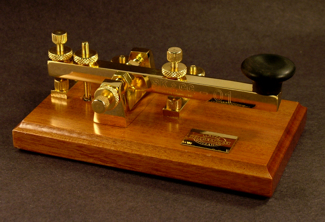 Based on LTA's "Marconi" key, the SKCC Key features an antique Marconi style key on an oak base. The key features front and rear contacts (for make-break keying), and a cantilever tension spring at the rear of the lever. All of the hardware is plated in 18K gold for durability and reliable conductivity as well as appearance. To see other LTA keys offered by Morse Express, click here. The SKCC Logo is engraved on the side of the lever, along with a serial number.. The photo above shows Serial Number 1. Click on the photo to view it in full size. The SKCC Key sold out in August of 2008, following the death of the manufacturer. They may become available again later, or SKCC might commission a different "official" key. Watch this space for details.